Michael Vaughan has described the England and Wales Cricket Board’s treatment of Peter Moores as “disgraceful” after he was sacked as England coach on Saturday. Moores, who also coached England between 2007 and 2009, had been under pressure ever since England’s disastrous World Cup campaign earlier this year and the drawn Test series with the West Indies earlier this month convinced ECB bosses that a personnel change was needed to resurrect the national side’s ailing fortunes. Reports that Moores was on the verge of being sacked emerged on Friday during England’s washed-out one-day international against Ireland in Dublin and his departure was confirmed on Saturday afternoon, shortly after Andrew Strauss was appointed as the national team’s new director of cricket. 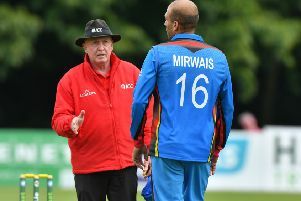 The nature of Moores’ exit has been criticised by several figures within the game and Vaughan, who revealed he had held talks about the director of cricket job as recently as last month, offered a withering assessment of the ECB’s handling of the affair in his Daily Telegraph column. “I am not the biggest fan of Peter Moores as a coach but I like him as a person and the only word I can use for the way his sacking was handled is disgraceful,” wrote Vaughan, who captained England to Ashes glory in 2005. “It is not the first time this has happened. News broke of Alastair Cook’s sacking as one-day captain before he knew about it and now the same has happened with Peter. “It is a poor way to treat two men who have given everything to English cricket. I realise they are not universally popular but they deserved to be treated better by their employers.